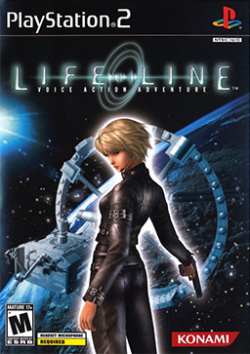 Game description: In Lifeline, you'll battle deadly creatures, solve puzzles, and escape from a space station--all with the sound of your voice. Trapped in the station's control room after a massive attack, you must use verbal communication--through the USB headset--to guide a female survivor, named Rio, around a hostile hotel environment. Voice commands, such as "shoot and reload," "dodge to the left," "look behind you," and others, will come in handy as you battle vicious aliens. USA v02.20(10/02/2006) This game work, but its really essential to play a USB headseat(headphonesps2*) for command the main character, but not supported for PCSX2 in the moment. No bugs found. The game requires a USB Microphone and corresponding USB plugin. You can get a USB Microphone plugin here. Description: Black Vertical lines on the screen. Workaround: Go to Config > Video (GS) > Plugin Settings, turn on "Enable HW Hacks", go to Configure Hacks and enable the "Align Sprite" hack. Alternatively set Internal Resolution to Native. This page was last edited on 15 February 2017, at 19:16.